Hello, Lil Blue Boo readers! 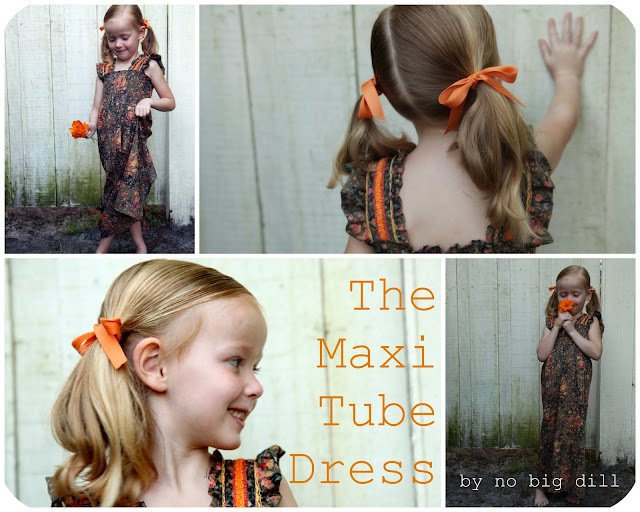 Here's my tutorial for The Maxi Tube Dress made from the fabric Ashley [of Lil Blue Boo] sent me for her What Would You Make series. She invited 4 seamstresses to participate, to see how differently a couple of yards can be used. It's been so fun to play with this fabric and make it into something that is my style. Plus, it's a super quick and very simple project that can be done by anyone who knows their way around a sewing machine. I've made a couple of variations on this dress in the past, like this one, and I'm always pleased how it turns out and how frequently it gets worn by my baby dills. It's easy to put on [and just as easy to care for] and comfortable to wear. Elastic thread, found in the notions section in white or black. Coordinating trim, two types, one wide, one narrow. o1 To begin, simply measure the length you'd like it [armpit to ankle] and add a couple of inches for hemming purposes [and even more if you like more wiggle room for measurement mess-ups ;) ] The width will depend on how much your elastic thread gathers and the size of your child. I don't cut the width until I have something to try on my child. Hem the top edge before you start by turning under 1/4" twice and stitching along the edge. o2 With the elastic thread in your bobbin, lengthen your stitch just a bit [3.5 or so]. Stitch several rows, 1/4" apart, until the rows reach the bottom of the rib cage when held up to your child. To further gather your fabric, hold a very hot iron over the stitching and steam for several seconds. Be careful not to burn yourself! With right sides together, sew the two sides together, making sure to use regular thread in your bobbin. I ended up adding a slit in the back to give more freedom in movement for Azure's flailing legs when she runs and dances. 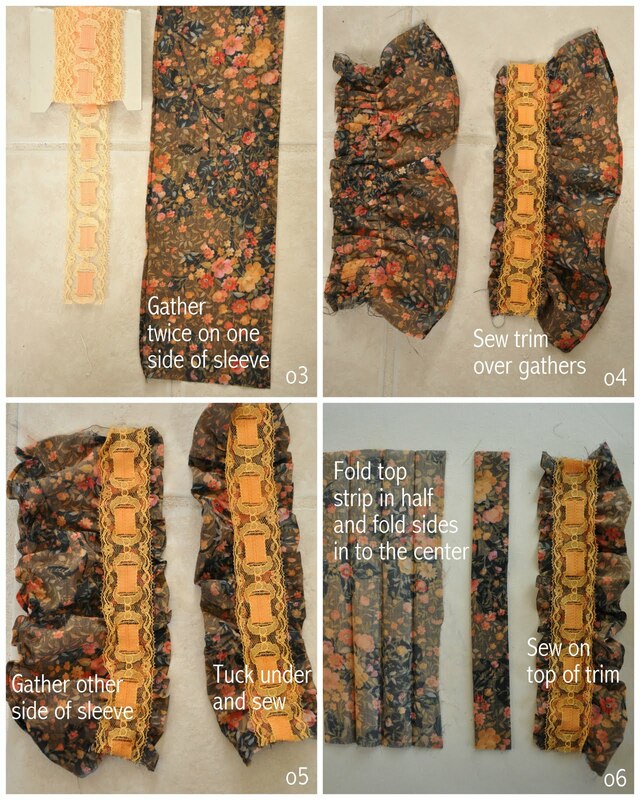 In this case, leave 10-12" on the bottom open to create a slit, and sew on either side. o3 The sleeves come next. I just used the extra fabric I cut off the bottom of the dress, about 5-7" wide, and again the length will vary. Hem one side of the sleeve [I just used the selvedge and didn't finish mine] and sew two basting rows to gather where your trim will lay. o4 Pin trim [which I ended up dying a bit darker shade of orange] over the two rows and stitch in place. o5 Gather the other side of the sleeve, using a basting stitch, the same amount as the first gathers. o6 Measure trim width, subtracting how much of the trim you want showing [I covered most of mine] and multiply by 4, cutting a piece of same fabric that size. Fold in half, hotdog way, press, open, fold outer edges into center, press. Stitch this on top of the trim, down both sides. Add second trim on top, stitching down both sides. o7 Pin straps where they fit your child comfortably and sew in place. Hem the bottom of the dress and that's it!! To see the whole photo shoot, as well as the other projects from What Would YOU Make series, hop on over to Lil Blue Boo. Isn't it amazing how the hands of the creator can turn the same material into such different outcomes? Thanks for inviting me to play, Ashley! Looks great Katy! Love the dye job. I had a romper out of a very similar material when I was little! I loved it. So cute! You did a great job. I may actually give the elastic thread a try! Looks beautiful! I just bought elastic thread on Tuesday for my next project, pretty similar to this one! I LOVE, LOVE this one! I've been wanting to try a maxi dress for my 5 year old, and this tutorial makes it look fairly simple. Thank you! Love the dress! I think even I could manage that one with these instructions! Nice take on the tube dress! Very cute with the ribbon details! 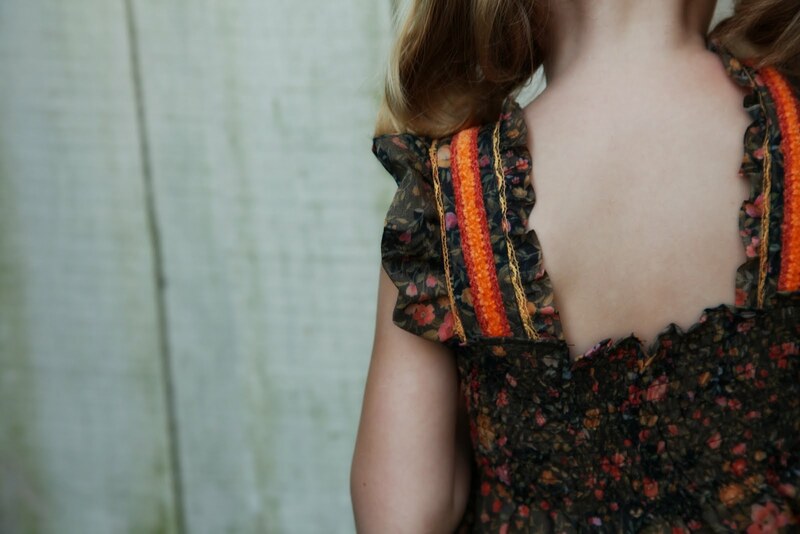 I'm afraid of elastic thread ( I know I'm a big baby) but that orange lacey trim...that is awesome. 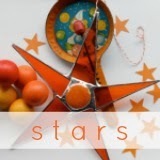 You are great inspiration and on my top three list of favorite blogs.. thank you.. It like it better orange. It's the perfect dress for a little girl like Azure--so cute! I love what you did with this fabric!! WHAT?! No b-day wish for baby brother Ben? so nice.. luv to try it out..